SINFONI observations at the VLT are showing an interesting feature in our galactic center, there are over a hundred stars sitting in two inclined disks close to the central black hole that can not be explained by normal means of star formation due to the strong tidal forces near the black hole. The outer edge of those disks is around 0.5 pc and the inner edge around 0.04 pc. The stars are mainly young (6 +/- 2 Myrs) O type and wolf rayet stars. 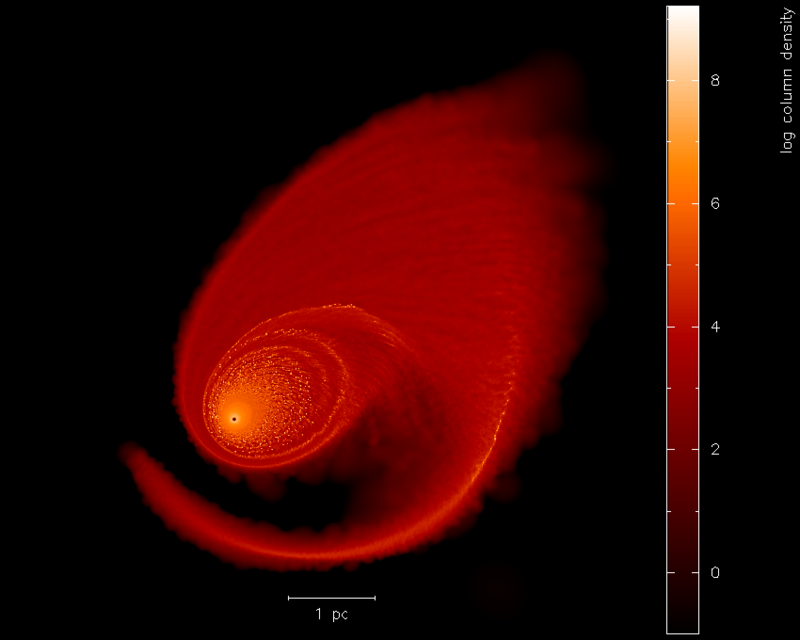 In our work we try to model the formation of those disks by a molecular cloud falling into the galactic center which then gets captured by the central black hole. This cloud will get tidally disrupted and form a gaseous accretion disk around the black hole. Eventually this disk becomes unstable, collapses and forms a stellar disk like observed. The picture shows the surface density of the simulation of such a cloud using the smoothed particle hydrodynamics (SPH) code Gadget-2 at 0.18 Myrs into the simulation. It can be seen that a disk formed around the black hole (The black hole is positioned at the black spot inside the disk) which is already starting to collapse into fragments, visible as high density spots across the disk. The next step will be to get more than one stellar disk by multiple cloud infall and to reproduce the kinematics of the stars like observed.